Vogue and other magazines occasionally publish lists along the lines of ’50 Fashion Adventures’ or ‘101 Unmissable Ideas’ filled with gems that I can only assume are satirical such as – shock horror – using jugs of tap water instead of bottled! (Only with sprigs of mint and lemon slices of course, darlings.) I thoroughly enjoy reading these outlandish proposals. Several have always stood out to me, such as the idea of climbing a New York fire ladder in 6 inch heels and a mini-dress, or wandering through the Parthenon with the early morning light catching the hem of a couture-made ball gown. Both suggestions rest somewhere on the scale between ridiculous and deeply desirable. I think it is the juxtaposition between the setting and the outfits – of the startling images suggested in placing ‘high fashion’ in real locations. These lists are wonderful precisely because they offer beautifully dressed escapism, coupled with a glimpse through an archway into another world. Like Alice, we as the readers kneel at an impossibly small door to witness the wonder of the garden beyond. It's unattainable, but the idea is enough. Neat bullet points and numbered lists are a satisfying way to order, collect and arrange things. However, my family and I came up with a slightly more sprawling list when recently walking in the rain, ignoring the drips sliding down our necks and damp rising through our socks. We compiled a collection of favourite activities to complete while out and about in the wilds. It's tailored to our own quirks and interests (there were many references to classic comedy series), but I felt it worth sharing. · Marching down a hillside while singing the Monty Python Philosophers’ Drinking Song word-perfectly, or reciting other favourite sketches such as the ‘Spanish Inquisition’ and the ‘Argument’ scene. Bonus points are given for sounding exactly like John Cleese, or for performing an updated ‘Ministry of Silly Walks’ routine. · Gathering up wild garlic, mushrooms or berries - according to the season. Blackberries spin purple-lipped grins, while bilberries are dark beads, threaded along a path. · Skipping as fast as possible down a slope or quiet road – the steeper the incline, the better. The after-morning aches are worth it. · Making a den using dead branches and leaves. 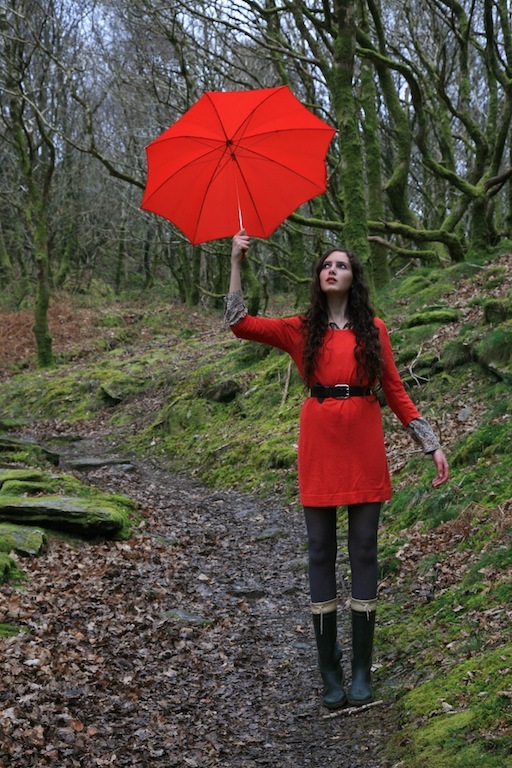 · Playing at ‘Singin’ in the Rain’ with a large umbrella and plenty of puddles to twirl around. The extension of this is a rainy picnic, details of which can be found here. · Alternately, an impromptu sunny picnic in the nearest field/park with a bright blanket. Food scrounged from the fridge and iced drinks drained into plastic bottles are always cheering. · To continue on the al fresco food theme, I'm looking forward to trying out a ‘midnight picnic’ once the days are longer - candles, warm food and tall wine glasses for clinking together while waiting for the sun to rise. · Plunging into mountain streams and rapidly retreating to the comfort of jumpers and flasks of coffee. · Making fires at night and watching sparks spitting up towards stars. · Taking a book and finding a sunny nook on the nearest hilltop. · Or, attempting to read and walk across a field in a straight line at the same time. · Spending a bike ride remembering and telling the rudest possible jokes. · Climbing trees: negotiating rotten branches and tricky gaps as knees are scored with scrapes. · Gorge-walking up rivers or streams in completely unsuitable footwear. · Leading one person ‘blind’ across an obstacle course of brambles, bumps and potholes. I thought it appropriate to post this list (and the photos) today, as Britain is still officially in the midst of the 'wettest drought' possible. Fields are slicked with water while rivers are brown roars. The steady tap-tap-tap of drops has been the soundtrack for the last two weeks. As much as I love jumping in puddles, I am loathe to do this when carrying my college bag and two heavy folders. Instead I hunch my shoulders and march against the wet, dull skies. What suggestions might you add to this list? Any traditions, favourite activities or brand new ideas for driving away rainy thoughts? Everything I'm wearing above came from various charity shops, including the umbrella - which was a matter of serendipity, as it just happened to be in the car when we climbed out to find yet more storm clouds overhead. You have no idea how much happiness your posts bring me at a time when external exams are fast approaching. You have just reminded me how much I love ferocious stick fights too - something which I had practically forgotten had existed - so I'm off now to find a stick and an eager friend. haunting. and epic. lovely as always! Goodness, you make these terrible rainy days seem not so dreary. And that outfit positively brightens up the dark scenery! Definitely go for monty python! I find the 'Four Yorkshiremen' sketch is a hilarious one for quoting! Also wanting to try out a midnight picnic at some point, with champagne, strawberries and candles everywhere! Telling anecdotes and reminiscing. This is one of my favorite blog posts, of anyone's, I've seen in a long time. I love this. I want to try a midnight picnic now too!! I also want to build a den. I love that first shot. I may have to do my own favorite things post sometime! Your posts are always so inspiring. And I absolutely love your photos! You have no idea how much I love making a fire and sitting around with friends. This is such a great post for dreary cold days. So beautiful outfit & photos! Shrubbery! It's just a flesh wound! I love the shades of red and greys in your photographs. They are indeed an archway into a beautiful world. Such a beautiful post, it made me miss the countryside so much. I love London but I do really enjoy a good adventure through a wild wet landscape! Theres something so lovely about damp country walks I think, the lovely mossy, earthy smell and the rosy cheeks one acquires whilst walking ! Anyway I do hope the rain clears up a little as its no fun all the time. Thank you for cheering my day along. For me having a shower ( naked ) in the summer when there is a sudden unexpected shower of rain! Luckily where we live is hidden enough that even the cows aren't frightened . Its good still having young thoughts in an older body !!! These photos are so charming, with a Mary Poppins in the country vibe. One aspirational fashion adventure I'd love to have is rambling over the North Yorkshire moors in a beautiful white dress... I'm determined to do it this summer, but I know from past experience that it's usually either raining or blowing a gale or both and I'll end up in some horrible garb for my hike! Still eating an ice cream with a 99 while surrounded by sheep is aspirational and achievable, whatever the weather. I love how much the red pops against the dreary sky and dulled ground. I think that's the concept behind a lot of high fashion shoots - contrast. It certainly makes for interesting and surprising editorials. What a fun list! Some bullet points sound like geeky fun, while most sound downright romantic (at least for those of us surburban dwellers). The most nature I see is the tree in my neighbour's yard. It's a sad state, indeed. A magnificent, storm-brewing backdrop! May I borrow it?!! Your reds dance against it. I enjoyed reading your list. A dream I have is to be whisked off by helicopter to an oil rig at sea where at sunset I will dine by candlelight on the finest meal in the world. Sipping coffee afterwards, elbows resting on the linen tablecloth, I will gaze at the sea. My gown will shimmer in the moonlight. It all sounds so idilic. Wonderful photos, my dear Rosalind. Who took the pics- your pops? I like to guess - I think these seem like your dad's style- GREAT shots- you really are a magazine editorial come to life for me, Roz. The juxtaposition between your sunny outfits and the dreary weather is so beautiful and refreshing! The pictures are amazing....specially the last one! Airborne with a red umbrella and you have Mary Poppins being completely envious! Beautiful photos, and I love the mossy greens behind you. Breathtakingly beautiful and evocative. I'll be back to this post to absorb all the ideas and suggestions which will undoubtedly enrich my life! Reads like a Famous Five plan of action for summer - you've made me utterly nostalgic. Swinging across a country brook on a frighteningly disintegrating rope. Climbing 'a big wild cherry tree' like Anne of Green, finding a comfortable spot and daring to let go to read. Making perfume out of crushed petals and bottling it like you did when you were young, only watch out for Garden Rue: my sister tried that one once and it reacted with the sun causing bubbling sores all over her wrists and neck. Truly brightening post, thank you. You are in my pinterest now amongst my bloggers love. Oh my goodness, I want to go berry-picking. I'll have to fine a nearby berry-picking location. Surely there's one within a few miles from here. Your list is charming, and so is your outfit. The pictures are so whimsical with the pop of red against the dull gray sky, and it appears as if your umbrella is carrying you up into the air. I adore it. It's so beautiful where you live! It's actually quite chilly and windy today, and I live in Arizona and it's summertime, so it's quite dreadful. But I played with and walked precious dogs at the Humane Society, and that definitely made the weather less dampening on my mood.